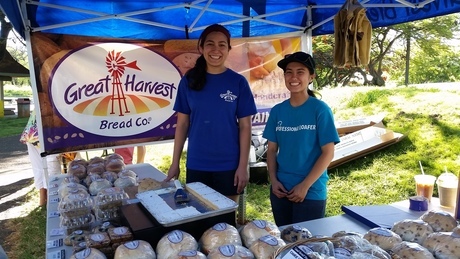 Giving Back Honolulu, HI | Great Harvest Bread Co.
At Great Harvest Bread Company in Kahala, the favorite line of our mission statement is “Give Generously to Others!” We welcome opportunities to share our bread and serve our local communities. We gladly donate to non-profit organizations bread for events, beautiful gift baskets for fundraising auctions, and cookies to reward students. Please don’t delay! Due to the volume of donation requests, we can only consider donations on the attached form that are submitted at least two weeks in advance of the needed donation. Unfortunately, due to production volume, we are unable to accommodate donation requests from November 15 through December 31. Please consider contacting us during any other time of the year. Thank you for your interest!